Catch of the day gets an Asian twist. Place a large sheet of baking paper or foil onto a baking tray and place leeks onto the bottom half. Set aside. Place all marinade ingredients into a bowl and mix well. Place fish on top of leeks and, using a sharp knife, score the fish by making vertical cuts 5cm apart along the length of the fish from head to tail. Spoon some of the marinade in between the butterflied fish and pour the rest over the whole fish, making sure to spoon some into the cuts that have been made. Season fish with freshly ground black pepper. Bring the edges of the baking paper together and fold to form a sealed parcel. Bake in the oven for 30-40 minutes or until the fish is cooked. 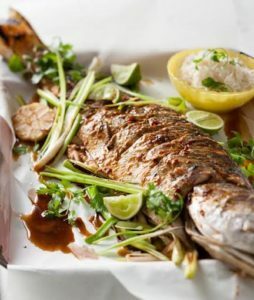 Serve with steamed coconut rice and wedges of fresh lime. On the face of it, the marinade has some big flavours and the temptation might be to pair an equally big wine but we’d recommend a white relatively low in alcohol and high in acidity – spice increases the perception of alcohol while acidity in food negates that in the wine. Think Sauvignon Blanc or Chablis-style Chardonnay.